The performance at Robinson did not go off without a hitch. Because it was Springtime for Little Rock, it was warmer outside. This necessitated the air conditioner being turned on. The fans rumbling through the vents made such a noise that it was difficult for the audience to hear the actors. The air cooler was turned off for the remainder of the performance. In the days after the performance, the Auditorium staff put buffering in the vents in the muffle the noise. 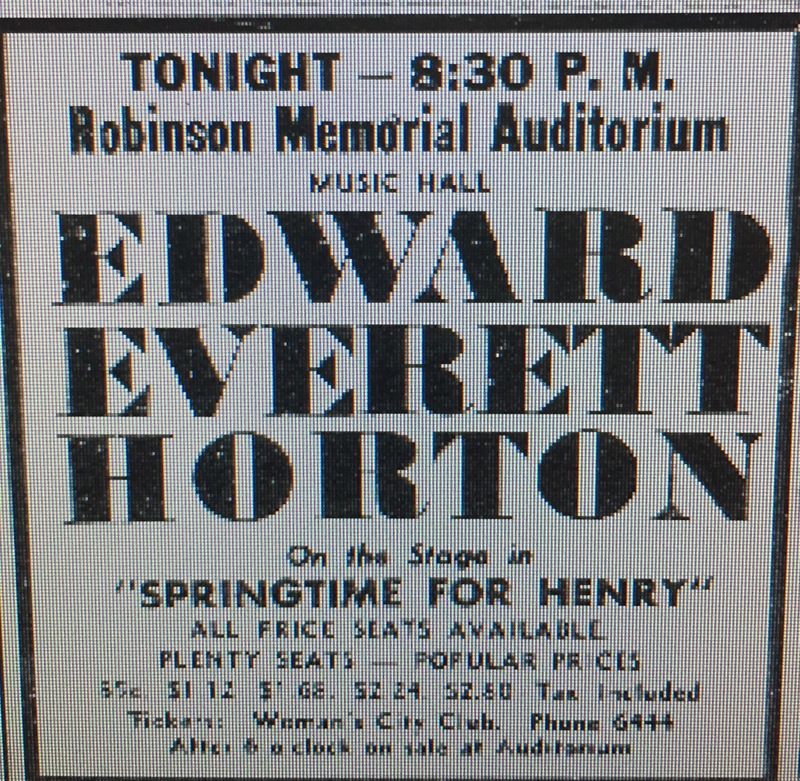 On April 1, 1940, stage and screen star Edward Everett Horton appeared in the comedy Springtime for Henry in the music hall of Robinson Auditorium. This was the first play to be featured on the stage of the Music Hall which had opened six weeks earlier. Springtime for Henry was a long-running vehicle for Horton. He first played its title role in California in 1932 (shortly after its Broadway debut in 1931) and continued to play it across the country for more than 25 years, including in the 1951 Broadway revival. As it was now springtime for Little Rock, the air conditioning was being used. The system’s fans made so much noise that echoed through the air ducts it was hard for the audience members to hear the actors. Once the source of this distraction was discovered, the fans were turned off; the next day plans were made to add acoustical buffering to the ducts to avoid a repeat of the situation. Since ELF is opening today as the first musical in the new Robinson Center Performance Hall, it seems appropriate to look back at the first play performed in the building’s earlier incarnation. Little Rock existed as a theatre town for over 100 years prior to the Tony Awards. But since this is Tony Awards week, “let’s start at the very beginning, a very good place to start” (words by my favorite lyricist Oscar Hammerstein II). The first documented theatrical performance was on November 4, 1834, and in August 1838 the construction of the first theatre in Little Rock was announced. Through Little Rock’s early years a variety of spaces were used for performances including the City Hall on Markham near Main Street which had been built in 1867. The opening of the Capital Theatre in December 1885 would be Little Rock’s first large-scale, non-church space for performances and gatherings. The Capital had a seating capacity of approximately 2,000 seats. Designed to house theatrical productions, it also played host to civic events ranging from high school graduations (for both the white and African American high schools) to public memorials. For instance, in 1901 it was the site of a public memorial for the recently assassinated President William McKinley. In time, the Capital Theatre (which was situated on land that is now occupied by a portion of the Statehouse Convention Center) would be joined by a variety of other theatres, public houses, vaudeville houses and lodge halls. When Robinson Auditorium opened in 1940, it had space to host theatrical productions in the main music hall as well as in the lower level “little theatre.” By that time, there were a variety of community theatre groups performing. The first national tour to play in Robinson was Springtime for Henry starring Edward Everett Horton. 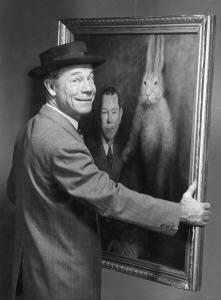 The first Tony winning production to play Robinson was the national tour of Harvey starring Joe E. Brown. Brown, in fact, received a special Tony for starring in the national tour of the play. Tenor James Melton performed on April 25, 1950. 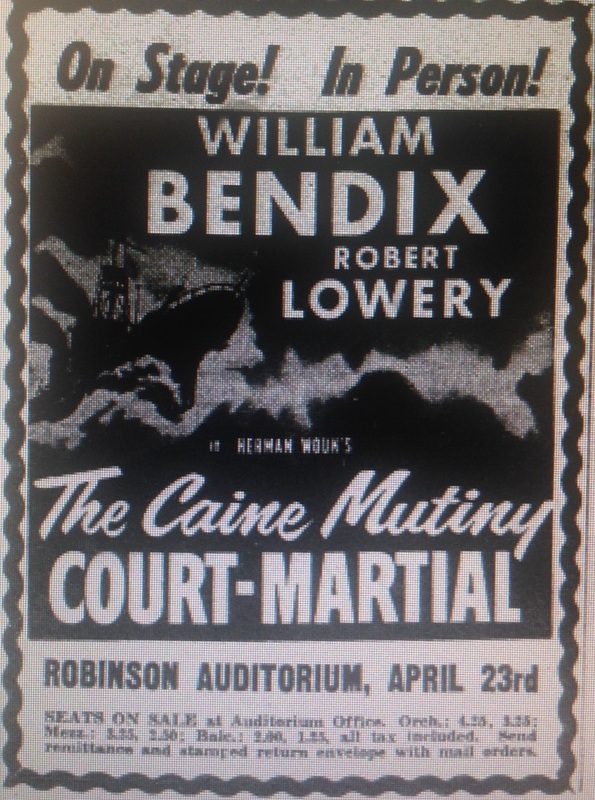 In April 1955, the lineup included William Bendix in The Caine Mutiny Court-Martial on the 23rd. The next night the Spring Music Festival took place. It featured school children performing. On April 25 1960, The Coasters, Bo Diddley, LaVerne Baker and others. The month ended with a youth concert aimed at children. April 1970 included a production of Arthur Miller’s The Price (the 6th), the Southwest Regional Ballet Festival (April 11) and drummer Buddy Rich (April 18). In April 1975 (the 6th) Hair returned to Robinson for one performance. This time there was no controversy such as had met the first visit a few years earlier. April 1985 was very busy. On the 13th, there was a Ballet Festival Gala. April 20 & 21 featured an Arkansas Symphony Orchestra classical concert. A touring production of the musical Gigi performed on the 22nd. It starred Louis Jourdan (who had appeared in the Oscar winning film, albeit in a different part), Betsey Palmer and Taina Elg. The ASO was back on April 28 with a children’s music concert. Cathy Rigby flew into Robinson Center with a tour of Peter Pan from April 10 to 12. On April 4, 1995, the Community Concert Association brought the Russian Seasons Dance Company for a performance. The Arkansas Symphony Orchestra performed Verdi’s Requiem Mass in Memory of Manzoni on April 8 & 9, 1995. Singer Millie Jackson wrote and appeared in the play Young Man, Older Woman, which played on April 30 of that year. Several Contemporary Christian music acts performed on April 3. The Arkansas Symphony Orchestra closed their 1999-2000 season on April 8 & 9 with a concert featuring Carolyn Brown on flute. On April 27, 2000, President Clinton headlined a memorial service for civil rights activist Daisy Bates. April 2005 was full of a variety of performances. Natalie Cole was in concert on April 3 with the Arkansas Symphony Orchestra. On William Shatner narrated David Itkin’s Exodus with the Arkansas Symphony Orchestra on April 9 & 10, 2005. Arkansan Kyle Dean Massey starred in the tour of 42nd Street which started its performances at Robinson Center on April 18, 2005. In conjunction with an exhibit at the Old State House Museum, a gospel concert featuring the Racy Brothers and the Hunter Brothers closed out April 2005 on the 30th. David Itkin bid farewell to conducting the Arkansas Symphony Orchestra in April 10 & 11, 2010, with a performance of Mahler’s Resurrection Symphony. On April 15, the Electrify Your Strings! concert took place. Comedian Gabriel Iglasias and his Fluffy Shop Tour stopped at Robinson on April 24.